The Federal Reserve bailed out of the banks, Freddie and Fannie a while back. Just before the real estate bubble burst, houses were sold for big bucks. The seller got the cash from the banks and the buyer got the house, which they gave back to the bank. Notice in a real estate transaction, the buyer normally will over a span of 20 to 30 years, pay back the loan with interest. At this point, the bank has an insurance loss on the home. It’s worth a couple of hundred thousand less than what the bank loaned money on. What is not real clear here is the economic ramifications of a buyer walking away from a home and living in it for free for one to two years. The Federal Reserve is the insurance company that covers these failed loans and reimburses the banks for their loss. The original seller got 500K for the home and the Federal Reserve picks up the property. The Fed has an IOU written to itself for the amount it covered for the bank, in this case 250K plus the house itself. It now can offer very enticing interest rates to any buyer that would like to purchase the home at say $400K. Since the Federal Reserve doesn’t have to make a profit, the interest charged and the total payments over 30 years will probably cover to total cost that the Feds are on the hook to cover, 500K. The seller got 500K when the buyer took possession. The bank was made whole with a 250K payment from the Federal Deposit insurance. That 250k was supposed to enter the market slowly over many years out of the buyers paychecks from wages earned. This was money that the homebuyer would not be able to spend on consumption because it was committed to house payments. That is no longer the case. The buyer took a walk, and the deficiency was dumped back into the market as an insurance payoff to the bank. Plus now, the ex-buyer is free to consume other things with his paycheck. I could be shot again for my generalizations, but if we examine the real estate bubble, the house was well worth 250K pre bubble and sold for 500K. The seller made a 250k profit and the Fed dumped 250K into the banks’ balance sheet. And when you look at it, the money in the banks belongs to the savers, so everything is just terrific nobody has lost a dime. At this point you have 250k (seller profit) + 250k (FR insurance)=500K extra added to the economic market in purchasing power that no one ever even worked for. Now true, if the Fed sells the home for 400k, the 500K will come back to the Fed and we have a zero sum game, the trouble is, that date is 20 to 30 years away. Where did all of this unearned money go? The answer is not really clear here. It is quite possible that it went into the real estate market, the stock market and IRA’s. If the banks wanted your money real bad, they would pay more than the paltry one percent interest. The one thing that is for certain, the Federal Reserve wants the highest price it can get for the real estate it manages (ergo keep interest rates low). Uncle Sam, the used car salesman, will give you the deal of the century on a used home. The lender of last resort, the Federal Reserve, has taken all risk out of the real estate market. Maybe that’s why the stock market is so inviting, no government controls. The defaulted loans were a promise by the buyer, to surrender future earnings for the house being purchased. His labor over 20 to 30 years was going to pay for the house in a long drawn out time release program. Well, that didn't happen. The money that the seller received was his to keep. The money lost by the bank was depositor's savings and the amount was made whole again by the Federal Reserve. The sale of just one home worth 250k has blasted the financial market with 500k of money that was never earned by producing product. The funny thing is, all dollars are equal, the one you had to work for is no different than the one that was printed to cover up the real estate fiasco. Common sense suggests, that there is more money out there than there are goods to buy at present prices. And if you don't have a job, this sort of common sense is no consolation when it comes to paying the bills. But if you do have a job, it kind of explains why your paycheck doesn't go as far anymore. Two different perspectives and they are worlds apart. The Minimum Wage " A Tempest in a Teapot"
Listening to the radio driving home from work the other day I heard a 19 year old single mom saying she couldn’t raise her child on the minimum wage. I’d go so far to say that her wages probably wouldn’t even cover paying for day care while she worked. She had problems before she started looking for a job. In the early 1980’s I couldn't find any work in Colorado, so I bought a lawnmower and placed an ad in the local paper. I had no trouble making lots of money, but cutting the same lawn time after time was not mentally stimulating to me, I was bored to death, but it left my winters open for skiing. My only point is that many people expect someone to offer them a job. It doesn’t have to be that way, you can create a job yourself---no job application required. If we were to examine a small business today, employing 20 workers, at 8 dollars an hour, for 40 hours, just the payroll would be $6400 for the week. Now raise wages to $15 an hour. The employers’ budget is still $6400. He has 20 employees currently earning $320 a week. Divide that by $15 and we get a 21 hour work week. On the downside, the more productive employees will move to jobs with more hours, so in the long run, a worker who can hustle, will get the better wage. Over time the successful employer will have to pay more to keep their most productive employees. The increase in wages also changes the economic factors that determine if it is more practical to move production overseas. Notice however, in the public sector, when you pay more to keep employees, you are also committed to paying the "dead wood" the same rate and there is no way to fire these bad apples. 40 years ago, civil service was a way to get experience for your future job in the private sector. The dead wood employees stayed there, at a low wage forever. Back then, there was a stigma attached to civil service employees—-loser was a polite term for them; they couldn’t get a real job. The neat thing about that era, was that the taxpayer didn’t pay extra for civil service incompetence, if you were good at what you did, the private sector had a job waiting for you at twice the pay. Things have sure changed since then. In the fast food business, it is now practical to build a machine to grill hamburgers and I'm sure French fries won't be far behind. The entrepreneur has the option, to replace labor with machines. Robots don’t join labor unions and can work 24/7. If an automatic hamburger griller costs 100K and replaces 3 people, how long would it take to pay for the grill? At $8 per hour, about 2 years, at $15, a little more than a year. Do the math, that job will disappear. A school janitor today probably makes about 20 dollars an hour. Do you think that he graduated from high school and got hired for the job on the spot? I can still remember our high school janitor 50 years ago; an immigrant from Italy with a bad limp named Luigi (raising 3 boys). The school kids were cruel, they use to mimic his Italian accent and his limp. But there was a certain harsh reality that hasn't changed over time; “A high school education only prepares you for an entry job as a laborer.” Luigi worked hard to get a decent paying job and it didn't come overnight. 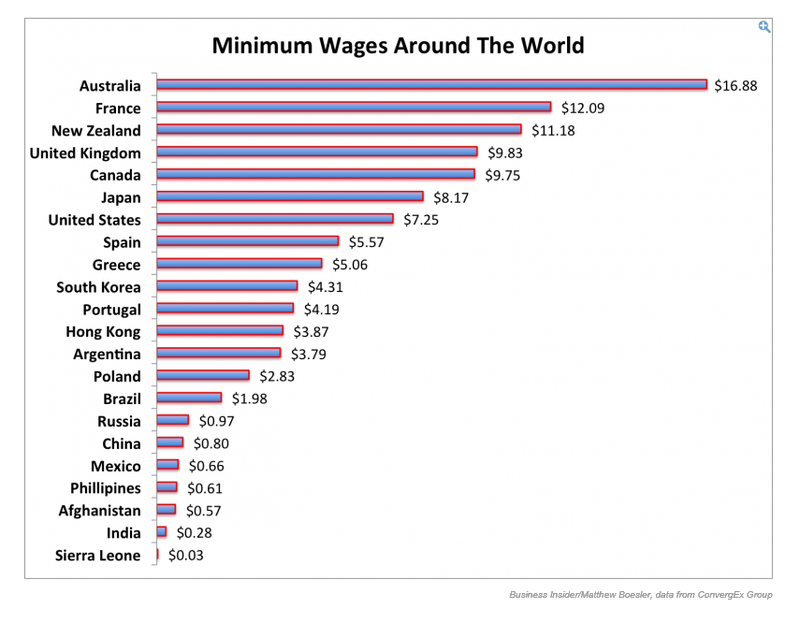 In today’s world, many jobs start at X amount more than the minimum wage. 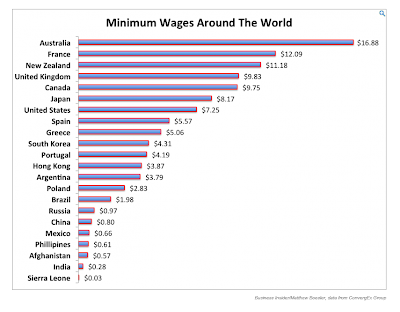 So raising the minimum wage increases everyone’s wages. Will the new reality reflect itself in the government Cost of Living Adjustment (COLA)? Of course, maybe we ought to create a Gullibility Index for the nation based on an inverse of the COLA value. As the COLA’s decrease, the Gullibility Index for the nation increases. The neat thing about raising the minimum wage is that it increases tax revenues. The poor will no longer be at the poverty level and will now pay taxes and consume less welfare---Why does that sound so absurdly insane? So with the proposed pay raise, everyone will get paid more for the same amount of work and everything we consume will cost more. Economics tells us that the minimum wage is set by supply and demand not government edict. I'm sure that we can get Congress to repeal the Law of Supply and Demand. And while we are at it, maybe Congresswoman Pelosi will introduce a bill to rewrite Newton's Third Law so we can get better gas mileage.